Sitting on the edge of the listed 200-acre Syon Park Estate, once home to aristocracy, Hilton London Syon Park is modeled on the old stable block which stood in the park over 200 years ago. Today this London hotel offers a relaxing retreat, only seven miles from the center of London. 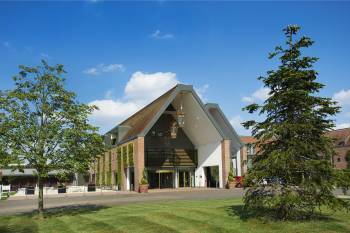 Bordering the Thames, the hotel offers easy access to London Heathrow Airport and all of London’s iconic attractions.Experience the charm of the estate and try a range of recreational activities including walking and jogging on the grounds, archery, croquet, and trout fishing. Explore the beautiful gardens and discover the Syon House Great Conservatory, dating back to the 1830s. Treat yourself at Kallima spa, take a swim in the indoor pool or enjoy a workout in the 24-hour fitness center.Choose this scenic setting for a memorable wedding, social event or meeting. Combining historic elegance with modern business conveniences and flawless service, this London hotel offers the perfect venue for all types of event. The ballroom is ideal for memorable wedding receptions, and a choice of boardrooms with the latest technology make for successful meetings.The Restaurant offers a casual dining experience set within inspiring surrounds. Gather with friends and family for drinks in the stylish hotel bar or afternoon tea on The Terrace.